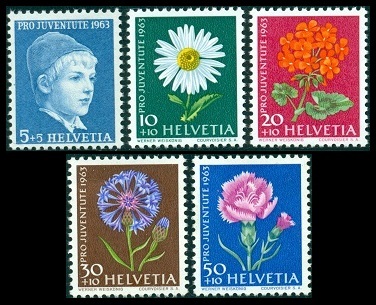 Most of the Pro Juventute Swiss stamps issued between 1958 and 1964 feature the theme of Garden Flowers. 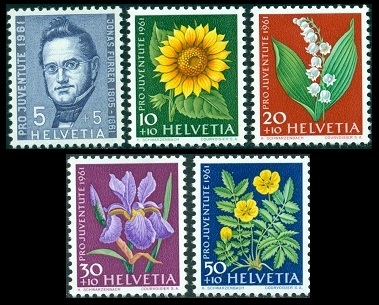 The lowest denomination stamp in each set usually honors a famous personality. 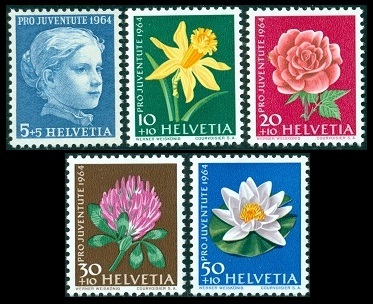 All of the Pro Juventute stamps were issued on December 1 of each year. The thematic issues in each set are photogravure, and the portrait issues in each set are engraved. 10 C. + 10 C. - Pansy (Viola wittrockiana). 20 C. + 10 C. - China Aster (Callistephus chinensis). 30 C. + 10 C. - Morning Glory (Ipomoea caerulea). 40 C. + 10 C. - Christmas Rose (Helleborus niger). The 05 C. + 05 C. denomination stamp was issued to honor Albrecht von Haller (1708-1777), a Swiss anatomist, physiologist, and naturalist. He is often referred to as the "father of modern physiology". 10 C. + 10 C. - Marigold (Caltha palustris). 20 C. + 10 C. - Poppy (Papaver rhoeas). 30 C. + 10 C. - Nasturtium (Tropaeolum majus). 50 C. + 10 C. - Sweet Pea (Lathyrus odoratus). 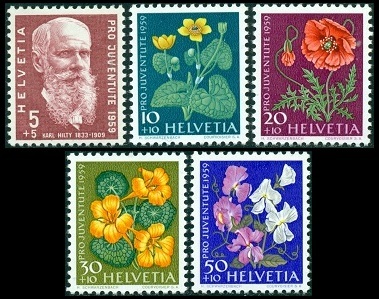 The 05 C. + 05 C. denomination stamp was issued to honor Karl Hilty (1833-1909), the Swiss philosopher, writer, and lawyer. 10 C. + 10 C. - Dandelion (Taraxacum officinale). 20 C. + 10 C. - Phlox (Phlox paniculata). 30 C. + 10 C. - Larkspur (Delphinium consolida). 50 C. + 10 C. - Thorn Apple (Datura stramonium). 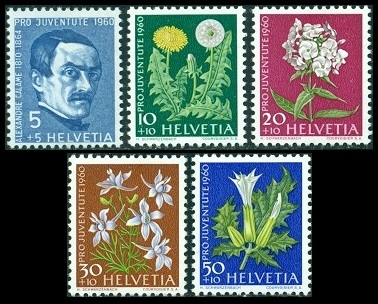 The 05 C. + 05 C. denomination stamp was issued to honor Alexandre Calame (1810-1964), a Swiss painter, specializing in Alpine landscapes. 10 C. + 10 C. - Sunflower (Helianthus annuus). 20 C. + 10 C. - Lily of the Valley (Convallaria majalis). 30 C. + 10 C. - Iris (Iris). 50 C. + 10 C. - Silverweed (Potentilla anserina). The 05 C. + 05 C. denomination stamp was issued to honor Jonas Furrer (1805-1861), a member of the Swiss Federal Council and the first president of the Swiss Confederation. 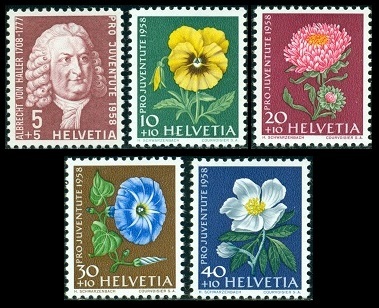 The five Swiss stamps (Zu. WI #193-97, Mi. #758-62, Sc. #B318-22) and the souvenir sheet (Zu. WI #199, Mi. Block 18, Sc. 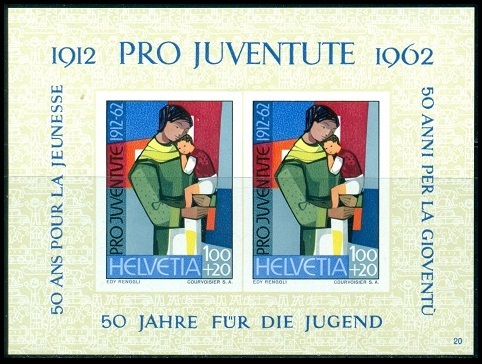 #B323) shown above were issued on December 1, 1962 to commemorate the 50th Anniversary of the Pro Juventute (For the Children) Foundation. 05 C. + 05 C. - Apple Blossoms. 10 C. + 10 C. - Boy chasing a duck. 20 C. + 10 C. - Mother and child. 30 C. + 10 C. - Girl and Sunflowers. 50 C. + 10 C. - Forsythia. 01 F. + 20 C. - Mother and child (facing right). The size of the souvenir sheet is 82 x 62 mm., and it sold for 3 Francs. 10 C. + 10 C. - Daisy (Leucanthemum maximum). 20 C. + 10 C. - Geranium (Pelargonium). 30 C. + 10 C. - Cornflower (Centaurea cyanus). 50 C. + 10 C. - Carnation (Dianthus caryophyllus). The 05 C. + 05 C. denomination stamp features a Portrait of a Boy by the Swiss painter and illustrator Albert Anker (1831-1910). 10 C. + 10 C. - Daffodil (Narcissus pseudonarcissus). 20 C. + 10 C. - Rose (Rosa). 30 C. + 10 C. - Red Clover (Trifolium pratense). 50 C. + 10 C. - Water Lily (Nymphaea alba). 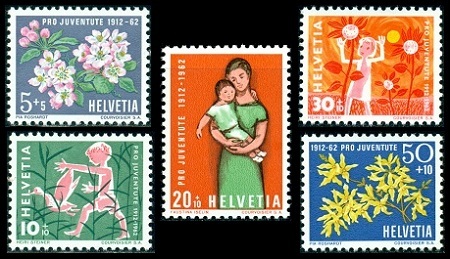 The 05 C. + 05 C. denomination stamp features a Portrait of a Girl by the Swiss painter and illustrator Albert Anker (1831-1910).